Kids are rejoicing – Halloween is on a Saturday this year! Parties will go later, kids will stay out trick-or-treating later, and you’ll stay up eating candy later (wait what?) Even if you aren’t a typical candy-eater, during this spooky time of the year delicious, colorful candy is everywhere. So, not only are you indulging in more sugar, you are probably planning on shelling out a good chunk of money on themed items. In 2014, Americans spent $2.2 billion on candy, $2.8 billion on costumes ($1.1 billion for kids and $1.4 billion for adults), and $350 million on pet costumes. While those are some shocking numbers, another shocking number is 3.4. As in, the average American consumer eats 3.4 pounds of candy over Halloween. Yikes! 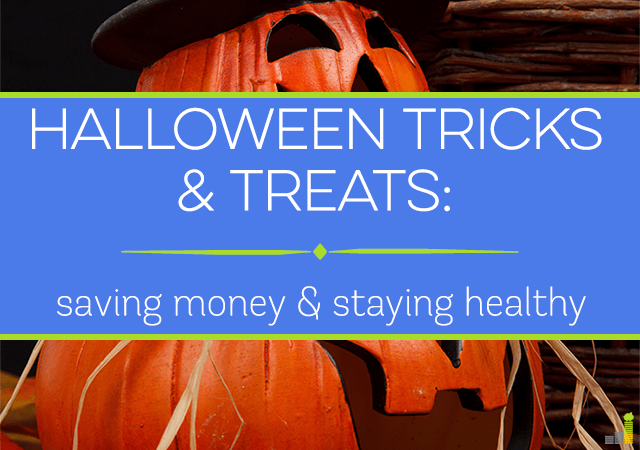 Here are some tricks to treat your wallet and belt this Halloween! Since kids don’t have to wake up and go to school the day after Halloween this year, you can bet that they are going to be staying out later, which means you will probably have more visiting trick-or-treaters this year. If you plan on handing out candy to the little ghouls and princesses, go to a store that typically sells food in bulk. Buying pre-packaged packs at the supermarket or pharmacy can be very expensive. Your local Costco, BJ’s, or Sam’s Club will offer candy at a much lower cost. You can even buy candy from the Halloween store on Amazon in some instances and save money. One easy way to make sure you don’t over-indulge in candy is to not buy it. Your excuse that you are buying for trick-or-treaters may be a valid one, but it might not stop you from eating a few pieces between visitors. And what about the leftover candy? Who gets to eat that? Instead, consider buying something other than candy to hand out on Halloween night. The local dollar store has lots of inexpensive toys and knick-knacks you can hand out instead. For example, glow sticks. What kid (or young-at-heart adult) doesn’t love glow sticks? Typically, you can buy a packet of glow sticks (usually 5 in a bag) for $1. You can even crack them open and hand them out already glowing. Not only will kids get a kick out of them, but their parents can keep better track of them in the dark, and you won’t add an unnecessary extra 500 calories to your day – win win win! There’s even an entire movement dedicated to passing out something other than candy this year. The Teal Pumpkin Project is dedicated to keeping kids with food allergies safe by keeping them from consuming nut-filled candies this year. After candy, costumes are the next Halloween items Americans tend to spend a lot of money on. With websites like Pinterest, who’s to say you can’t DIY your kid’s (and your) costume this year? Used clothing and secondhand shops are full of items just waiting to be re-purposed into a Halloween costume. Another benefit to this, other than saving money, is your costume will be unique. While your daughter may want to dress up as Elsa from Frozen like every other little girl in the neighborhood, her Elsa costume will be one-of-a-kind. Take a look at For Sale websites too such as eBay, Craigslist, and local Facebook garage sale groups. Many people are selling past year’s costumes for a fraction of what they would have cost brand new. Keep in mind that these costumes have most likely only been worn once so they are probably still in good shape. While you can’t buy candy a year in advance, the post-Halloween decoration sales are definite money savers! If you are someone who likes to cover the entire yard in scary décor, buying items right before Halloween can be expensive. Save 50-70% and buy lots of fun Halloween items after the holiday is over and store them for next year. A massive glow-in-the-dark spider will still be in style next year! 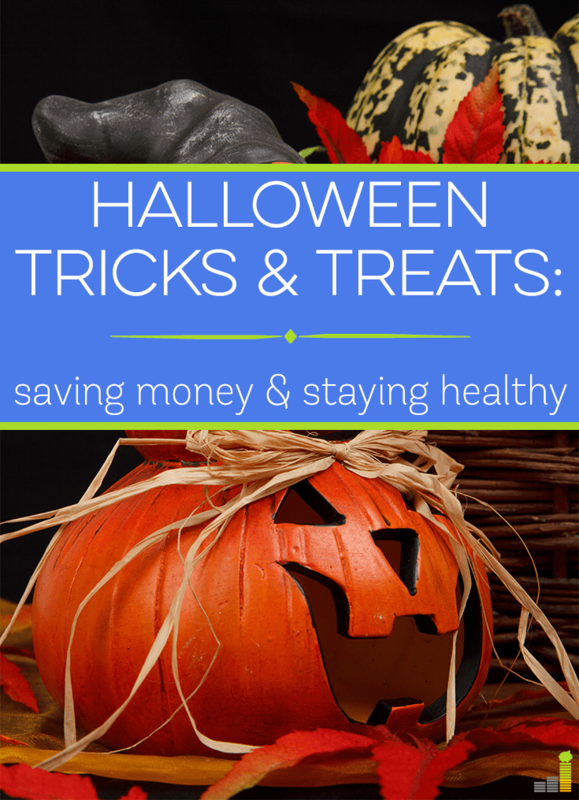 Quotacy, an online life insurance agency, loves Halloween just as much as everyone else and while Halloween brings us a lot of unhealthy snacks, we still like to remind people the benefits of making healthy and mindful decisions. Remember, making healthy choices leads to a healthier you, which can ultimately keep your life insurance rates lower. If you don’t yet have life insurance, get a term life insurance quote today. Not having life insurance is a scary thing! *This article brought to you courtesy of Quotacy. Good tips though I have to sort of disagree on the candy. That’s a big part of what Halloween is all about. If you do end up with extra, many places will gladly accept it so that you’re not ‘stuck’ eating it.